Up until the middle of the fifteenth century, each and every book in Europe was handmade. Books were precious, expensive, and prized possessions of monasteries and learned collectors wealthy enough to purchase them. With Johann Gutenberg’s invention of moveable type in the 1450s, plus other advances in engraving, book printing, and distribution, all of that changed. Venice was poised to be a leader in this expanding trade. The city’s geographic position as a gateway to the East, its preeminence in international trade, and its place as a center for knowledge exchange and artisanship made the Venetian Republic a natural setting for large-scale paper- and book-making to take root. Bookbinding studios, or legatorie, spread across Venice. Bookmakers enjoyed esteemed social status. Book production was a natural art for Venetians, who were already skilled at working with leather, pigments, and gold leaf. With the widespread use of moveable type instead of script, paper instead of vellum, and woodblock prints and engravings instead of hand-painted illuminations, the interior pages of books were dramatically transformed from their medieval predecessors. Early bookbinders discovered that when leather bindings came into direct contact with end papers, the result was discoloration and damage to the paper. They began facing the inside of the leather covers with hand-colored papers. This practice not only meant blank pages for creative and colorful paper displays, but bookbinders also realized they could reduce the amount of expensive leather they used in binding. Eventually, many bookbinders began using leather only for the spine, disguising the cover boards with colorful decorative papers. The practice of “marbling” paper—decorating paper with colorful patterns that imitate marble veining—probably originated in China. Over the course of the Middle Ages, Turkish masters of ebru, as the technique was known there, took the art to a new level. German and French bookbinders embraced these Eastern colored end papers early on, but most Venetian and other Italian bookbinders used surprisingly little colored decoration, preferring plain, white end papers and to focus on the leather binding of the book itself. By the mid-eighteenth century, though, several prominent Venetian bookmakers incorporated marbleized paper into their repertory of woodblock prints, copperplate engraving, leather binding, and other book production services. Marbleized paper (carta marmorizzata) is made by swirling pigments into a large, shallow pan of water, then laying the paper gently and briefly on the surface of the water to transfer the pattern. Because the designs sometimes mimic the natural veining in stone or marble, the word “marbleized” came to be used. In Venice, paper-makers traditionally began with viscous oil-based paints. These pigments, known as sizeor sizing, derived from various plants, including widely available aquatic ones. Today, many paper artists prefer synthetic acrylics and oil paints. Artists apply the paints into a wide, shallow tray filled with water. Sometimes a surfactant is used to help the colors float on the surface. Traditionally, artists used ox gall to serve this purpose, though today there are synthetic surfactants on the market. The creative aspect of paper marbling comes next, when the artist applies the colors to the water using any number of techniques from dropping or splattering paint using paintbrushes, horsehair or straw whisks, or other tools to apply color to the surface of the water in a particular design or order. After the color has been dropped, the artist may use a variety of tools—including rakes, styluses, combs, brushes, or even a single hair—to create swirls, lines, and other design elements in the paint. 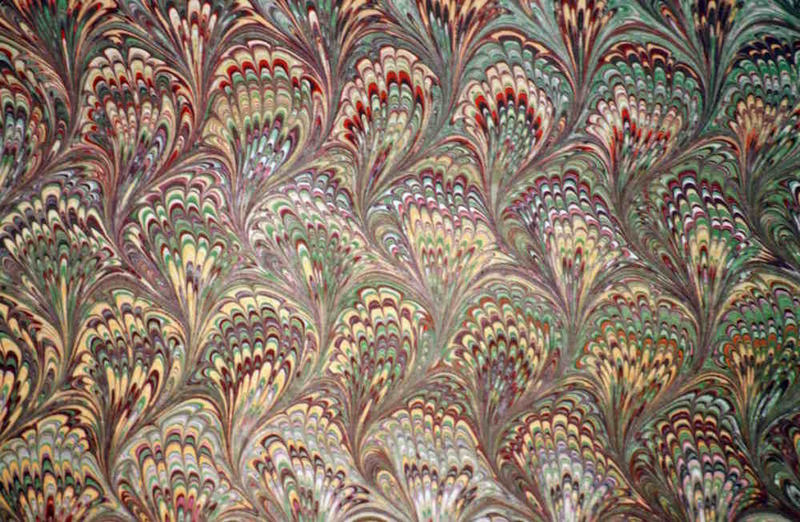 The techniques used to marbleize paper are closely related to the art of batik, laying pigments on fabrics. In fact, some paper artists are also active practitioners of fabric and fashion design. Chiocciola (snail) or conchiglia (shell):With a beautiful sense of movement, the shell pattern is made by forming each coil with a stylus. Marmo pettinato (combed marble):This design is created by dragging a rake-like tool through the pigments, disturbing the horizontal lines and giving the impression of having been combed. Pavone (peacock):The appearance of peacock feathers is achieved with a special comb and rake. This is one of the most common patterns of paper marbling. Ebru is a special method of paper marbling sometimes referred to as “Turkish marbling” because its techniques are closely related to paper techniques that originated in Constantinople (Istanbul). 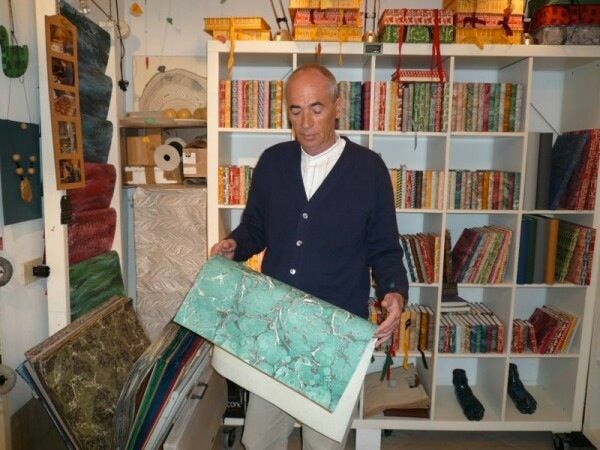 Papermaker Alberto Valese has played a key role in reviving the techniques and knowledge of ebru, having studied the art in Turkey and brought it home to Venice. “My work in ebru is not simple,” Valese tells me. “You have to have a lot of experience and patience in order to obtain good results.” In his shop, in the Campo Santo Stefano in the San Marco quarter, you can admire Valese’s talent in designing richly colored sheaths of paper, no two alike. 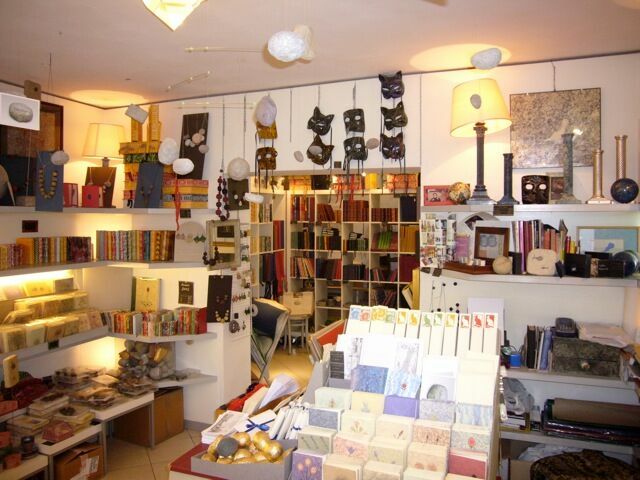 Shops all over Venice sell blocks of elegant stationery, sheets of handmade paper, leather-bound books with marbleized end papers, and a host of related items from fountain pens to wax seals, agendas, diaries, and calendars. Most of the books you see in the shops today are commercially bound, and the marbled papers are machine-printed rather than handmade. However, there are a few old-fashioned legatoriefashioning book bindings and making papers by hand. On the one hand, these shops are in business thanks to today’s lively tourism trade and a never-ending flow of international visitors. For traditional Venetian artisans, however, the tourism economy is a double-edged sword. More than ever before, increasing numbers of paper goods as well as carnival masks, glass, and other souvenirs flood into Venice, imported from overseas and passed off as authentic. Recently art organizations have worked to develop trademarks and new alliances to help protect their artistic heritage and to guard against fakes and cheap knockoffs. Legal regulations have also tightened. However, in the face of overwhelming numbers of visitors, Valese says, the well-meaning organizations that try to promote traditional artisans are not able to keep up. It is true. 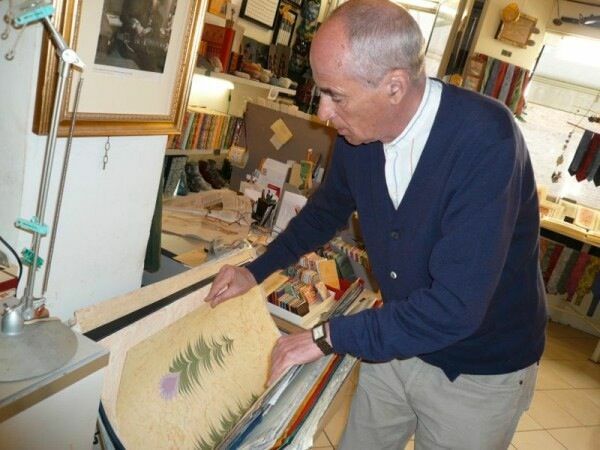 Over the last ten years I have personally seen multi-generational artisan shops in Venice close their doors—including paper makers, bookbinders, mask makers, and glass artisans. In the face of these challenges, I asked Alberto Valese what will happen to his own studio. The truth: There is no substitute for a knowledgeable buyer, for that helps keep these historical trades alive. The most cost-efficient and authentic approach to buying paper is to buy handmade pieces by the sheet. These papers may be used as giftwrap, or framed and hung on the wall for a beautiful display. Packaged into a stiff, cardboard tube, handmade paper sheets make an ideal portable Venetian souvenir. Many travelers to Venice are also looking to go home with authentic Murano glass. Read on for my insider’s guide to shopping for Murano glass here. Laura Morelli is an art historian and historical novelist with a passion for Italy. You can find her guidebook series, including Made in Venice and Made in Italy, as well as her Venice-inspired historical novel, The Gondola Maker, in the Italy Magazine shop.